Outfielder Jonny Gomes says he intends to make a comeback, ESPN.com’s Jerry Crasnick reports on Twitter. The lefty masher, who is now 36, last played in the majors in 2015 and appeared briefly in 2016 in Japan. Gomes was a productive part-timer as recently as 2013, when he played a big role for the Red Sox in a World Series-winning season. He took 366 plate appearances on the year, swatting 13 home runs and posting a .247/.344/.426 batting line — right at his career average (.242/.333/.436). But Gomes struggled over the ensuing two seasons. He bounced from the Sox to the A’s in 2014, then joined the Braves as a free agent before being shipped to the eventual-champion Royals for a dozen-game stint. (Though he did not appear in the postseason for Kansas City, Gomes did play a notable role in the excellent victory parade.) He needed 583 trips to the plate to match that 13-homer output, slashing just .225/.321/.337 over that two-year span. Despite the difficulties, Gomes was still useful when facing lefties in his most recent pair of MLB seasons. Indeed, his chief appeal lies in his work against opposing southpaws — who he has tuned up historically (.855 career OPS) — along with his hard-nosed style of play and noted clubhouse presence. While he had hoped to return to the big leagues after wrapping up his disappointing stint with the NPB’s Rakuten Golden Eagles, Gomes wasn’t able to secure an opportunity. While he surely could have landed a minor-league deal, and acknowledged that would likely have been necessary, he suggested that he was interested only in signing directly onto a MLB roster at the time. It’s all the more clear now that Gomes will need to earn his way back to the majors in spring camp — or, perhaps, through a stint in the minors to open the 2017 season — as his age, layoff, and recent track record make a guaranteed deal seem implausible. Given the respect he commands around the game, though, Gomes figures to find a chance with an organization. 9:15pm: WEEI’s Rob Bradford tweets that he spoke to Gomes himself tonight, who said that he is not retiring. 3:01pm: Veteran outfielder Jonny Gomes has decided to retire, according to Chris Cotillo of SB Nation. The colorful performer hangs up his spikes after a 13-year run in the majors. Gomes, 35, last appeared briefly in Japan, and was said to be hoping to catch on with another major league organization. A suitable opportunity has evidently failed to materialize, however. Since his debut in 2003, Gomes has compiled a .242/.333/.436 batting line in just over 4,000 plate appearances. He was always at his best against left-handed pitching, of course, as he hung a lifetime .855 OPS on opposing southpaws. Gomes ended up playing for seven clubs in the majors after opening up with the Rays. He spent six years in Tampa Bay before moving on to the Reds in 2009 via free agency. After a brief stint with the Nationals, Gomes hit his second wind in a strong 2012 campaign for the A’s. That season in Oakland is probably when the game was fully introduced to the bearded, tattooed, high-spirited platoon man that Gomes will surely be remembered as. He hit full stride the following year with the World Series-winning Red Sox, playing an important role on the club that extended beyond his solid on-field contributions. Gomes never really put it together from that point forward, though he did still have use against lefties over 2014-15, which he spent in Boston, back in Oakland, and then with the Braves and Royals. Those, it seems, will be the last seasons of his career. While he wasn’t on the post-season roster for Kansas City last year, Gomes did memorably brandish a large American flag at the massive celebration following the team’s World Series victory. That added yet another enduring image for a player who played the game hard and with notable verve. MLBTR congratulates him an a memorable run. Veteran outfielder Jonny Gomes has wrapped up his stint with Japan’s Rakuten Golden Eagles by “mutual consent,” Ken Rosenthal of FOX Sports reports. He is interested in opportunities with major league organizations, though Gomes acknowledges that he’s not really in position to sign onto a MLB roster. Gomes did suggest that he can “bring way more to a team” than on-field performance, and there is little doubt that his celebrated clubhouse presence would help draw interest. But the 35-year-old struggled with Rakuten, putting up a .169/.280/.246 slash with 22 strikeouts in 75 plate appearances. Of course, Gomes only ended up pursuing an opportunity abroad after battling through a pair of rough campaigns. Over 2014-15, he posted a collective .225/.321/.337 batting line in 583 trips to the plate with the Red Sox, Athletics, Braves, and Royals. Though he did still hit lefties at an above-average clip, Gomes checked in below replacement level in both years. He’s never been a great fielder, and also took a step back on the bases in 2015. At his best, Gomes is a lefty-mashing fourth outfielder who can hold his own against right-handed pitching. He’s also provided surprising value on the bases (albeit not in the stolen base department) while receiving plaudits for his influence as a teammate. Veteran outfielder Jonny Gomes will sign a one-year, $2MM contract with the Rakuten Golden Eagles of Japan’s Nippon Professional Baseball, reports Ken Rosenthal of FOX Sports. The MVP Sports client can also earn an additional $1MM worth of incentives, Rosenthal adds, and his contract contains a mutual option for the 2017 season as well. The 35-year-old Gomes is known for his strong clubhouse presence and ability to crush left-handed pitching, although his numbers versus lefties have tailed off in recent seasons. Though Gomes has batted a very solid .250/.363/.409 when holding the platoon advantage over the past three seasons, those numbers do pale in comparison to the .284/.382/.512 batting line he posted against lefties up through the 2012 season. This past year, Gomes split the season between the Braves and the Royals, batting a combined .213/.313/.347 in 262 plate appearances (.227/.371/.412 against lefties). Gomes made clear to Rosenthal that he’s still planning on playing beyond the 2016 season, whether it’s in the Major Leagues or overseas. “This isn’t a farewell tour. This isn’t like my last year,” he told Rosenthal. “I have no plans of hanging it up. I can always come back or — if I take off over there — finish my career there.” Gomes also spoke about his excitement over adding another layer of experience to his resume with an eye toward coaching, managing or a career in broadcasting once his playing career is over. Analytics have taken over baseball and not everyone is thrilled about it, as Nick Cafardo of The Boston Globe writes in today’s column. Cafardo also broke down MLB’s teams in a T-chart of “Analytical” vs. “Traditional” and the split appears to be roughly 50/50. Interestingly, every team in the AL West is listed as an analytical club while the entire NL East is in the traditional column. There’s “some talk about” free agent Mike Napoli adding the catching position back into his arsenal, Cafardo writes. Playing as a first baseman/outfielder in the second half of the season, Napoli helped restore his value by hitting .295/.396/.513 with five homers for the Rangers across 78 plate appearances. Napoli would make sense as a right-handed-hitting complement to the club’s left-heavy lineup and GM Jon Daniels says that there is interest in a reunion. Agent John Boggs told Cafardo that client Shane Victorino wants to play in 2016. The agent added that Victorino is finally healthy and intends on getting back to switch-hitting. The Flyin’ Hawaiian hit just .230/.308/.292 in 2015 in 204 combined plate appearances for the Red Sox and Angels. Still, he’s only two years removed from his 2013 campaign in which he slashed .294/.351/.451 with 15 homers for Boston. Jonny Gomes would love to be a manager some day, but not just yet. “They’ll have to rip the jersey off my back,” the 34-year-old said. Last week, Gomes had his $3MM option declined by the Royals. On paper, that’s not an unreasonable sum for a platoon outfielder that posted a .371 OBP and a .185 isolated power (slugging minus batting average) against lefties, but KC opted for greater payroll flexibility. Gomes came to the Royals in an August deal with the Braves picking up half of his remaining salary. In his short time with the Red Sox, newly-minted Mariners GM Jerry Dipoto turned in a detailed report on the Sox organization from top to bottom, according to Red Sox top exec Dave Dombrowski. With that kind of intimate knowledge of the Sox, Cafardo speculates that it would make sense to watch for Mariners/Red Sox trade talks. Some have theorized that ex-Blue Jays GM Alex Anthopoulos will eventually become the GM of a Montreal franchise, whether it’s by expansion or the relocation of the Rays or A’s. While that could be a fit, Cafardo writes that AA is very likely to get a job before that takes place. The Royals announced on Thursday that they’ve exercised their $8MM club option over Wade Davis and their $5.25MM club option on Alcides Escobar. Veteran outfielder Jonny Gomes had his $3MM club option declined. It’s a stretch to even say that the Royals faced a decision on either Davis or Escobar, as both of those contract options boiled down to little more than a formality. Each is an extremely affordable and reasonable rate for the value that player brings to the table, and there was never a doubt that either would return. Gomes’ option perhaps required a bit more thought, as $3MM for a platoon outfielder that posted a .371 OBP and a .185 isolated power (slugging minus batting average) against lefties seems at least somewhat reasonable, but Kansas City opted for greater roster and payroll flexibility. Chase Utley, Dodgers: There’s no chance that Utley’s $15MM option — the first of three in succession — will vest. (He’d need 110 plate appearances over the final two weeks of the season to reach 500.) Instead, Utley will become subject to a team option — the value of which floats between $5MM and $11MM based upon days spent on the DL. The precise details have yet to be reported, so it’s not yet clear how much it would cost Los Angeles to control the veteran. Neither is it known whether the team would have interest; Utley has a mediocre .200/.296/.347 slash over 108 plate appearances with the Dodgers. Jonathan Papelbon, Nationals: This one was taken care of as part of the deal that sent Papelbon to D.C. from the Phillies. Papelbon helped facilitate the swap by agreeing to take $11MM to throw next year for the Nats. He was already likely to reach the requirements for his option to vest at $13MM, but that agreement greased the wheels on a move he desperately wanted and removed any doubt as to his payday. David Ortiz, Red Sox: Big Papi has blown well past the 425 plate appearances he needed for his 2016 option to vest, though he’ll also need to pass an offseason physical. The question now is the value of the option. It has already reached $15MM, but would go higher if he makes his 600th trip to the dish. In that case, it will go to $16MM (or, if it’s more than that, the value of the qualifying offer). Ortiz has earned it, with another huge season and successful run at 500 career home runs. Joaquin Benoit, Padres: Benoit needed to finish 55 games for to his $8MM option to vest. That can’t happen, so it’ll turn into a team option. It’s a fair sum for a reliever, but Benoit continues to put up strong results at 38 years of age. Marlon Byrd, Giants: The 38-year-old sits at 502 plate appearances. He needs 48 more the rest of the way to reach 550 total, which, in combination with those accumulated last year, would be sufficient for his $8MM option to vest for 2016. With 13 games left, it’s still possible that he could reach the needed total, but that’ll depend heavily on playing time — and San Francisco may well not wish to be on the hook for that kind of cash. Santiago Casilla, Giants: As MLBTR reported, Casilla needs 55 games finished for his $7.5MM option to vest for 2016. The situation is somewhat similar to Byrd’s. With 49 finished games in the bank so far, it’s still possible — but, perhaps, unlikely — for Casilla to reach the necessary tally. Nori Aoki, Giants: Due to injuries, the outfielder is stalled well shy of the 550 plate appearances he needed to turn a $5.5MM club option into one of the mutual variety. That could still be an appealing price tag for a player who performed well when healthy. Jonny Gomes, Royals: Gomes needs 325 plate appearances for a $3MM club option for 2016 to become guaranteed. He only has 246, and hasn’t been used much in Kansas City, so that’s not happening. We already know that Cliff Lee won’t achieve the innings totals required for his 2016 option to vest, as the Phillies southpaw hasn’t pitched all season and is attempting to recover from a torn left flexor tendon without undergoing surgery. Brandon League also hasn’t pitched this season and has been released by the Dodgers, so he won’t reach the games-finished total required to allow his 2016 player option to vest. TODAY: Atlanta will pay half of Gomes’ salary the rest of the way, or about $380K, per Heyman (via Twitter). 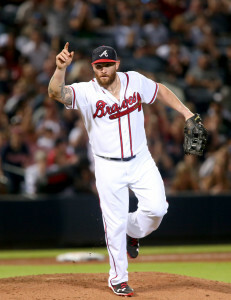 YESTERDAY, 8:42pm: The Royals have officially acquired outfielder Jonny Gomes from the Braves, as Ken Rosenthal of FOX Sports first reported on Twitter. Atlanta will send cash along with the veteran and will receive minor league infielder Luis Valenzuela in return, as Jon Heyman of CBSSports.com reported (Twitter links). Gomes, 34, is a highly-regarded clubhouse presence and noted lefty killer at the plate. Though he’s seen his power numbers drop off this year, and owns only a 93 OPS+ overall, Gomes has still slashed a productive .247/.412/.466 against opposing southpaws. The Braves signed Gomes to a one-year, $4MM free agent contract this winter. It includes a $3MM club option that would vest at different amounts based on various plate appearance thresholds. With Gomes likely to see only part-time duty, it’s unlikely that he’ll meet the minimum of 325 plate appearances (which would cause the option to vest at $3MM). Kansas City is all but certain to win the AL Central at this point, so the move was presumably made with the post-season in mind. It isn’t hard to imagine Gomes seeing some important at bats in potential playoff matchups against pitchers such as David Price, Dallas Keuchel, and Cole Hamels. It remains to be seen, though, what kind of alignment the Royals are pondering. Obviously, Alex Gordon and Lorenzo Cain will receive regular playing time so long as they are healthy. Among the club’s other righty outfield bats, neither starter Alex Rios nor fill-in Paulo Orlando have done much against left-handed pitching. In Valenzuela, who just turned 22, the Braves will receive a player who reached the Class A level for the first time this year. Over 184 plate appearances, he’s slashed .339/.368/.483 with three home runs and eight stolen bases.